and reconstructions that are false. Dr. Hans Thewissen, Professor of Anatomy at Northeast Ohio Medical University (NEOMED), is a whale evolution expert. He is famous for discovering the walking whale Ambulocetus and a nearly complete skeleton of the walking whale Pakicetus (shown in the picture above). St. Louis Missouri April 7, 2014 (Updated August 28, 2017). Whales with four legs, walking on land, are currently considered one of the best fossil proofs of evolution 1, 2, 3, 4, 5, (click on numbers to see footnotes) but now this evidence has collapsed according to science documentary maker Dr. Carl Werner. After interviewing the two scientists who reconstructed the fossils of the three famous walking whales, Rodhocetus, Pakicetus and Ambulocetus, Dr. Werner has concluded that scientists created false models of these skeletons and skulls and passed them off to museums. The made-up models are currently on display at the American Museum of Natural History in New York, the Carnegie Museum in Pittsburgh, the National Museum of Nature and Science in Tokyo, the Paris Natural History Museum, the Naturalis Museum in Leiden, Netherlands, the Museo Storia Naturale di Pisa, the Canadian Museum of Nature, and the Melbourne Museum in Australia. Also, the website of the Natural History Museum of London currently displays a false skull and model, painfully reminding British scientists that they have another Piltdown in their midst. 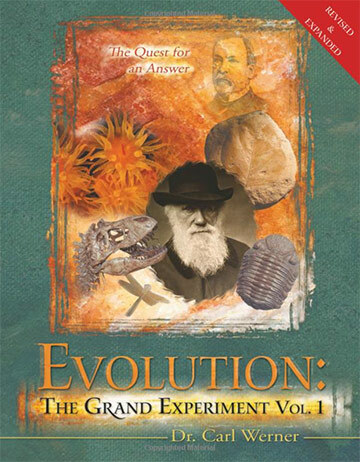 Dr. Werner’s journey started with his 2001 interview with Dr. Phil Gingerich, Curator of the Museum of Paleontology at the University of Michigan. Dr. Gingerich is recognized as the world’s leading authority on whale evolution. 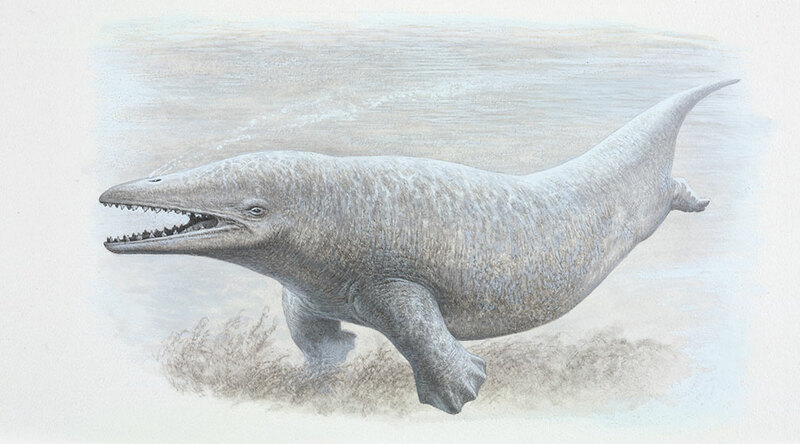 In 1994, Dr. Gingerich reported finding Rodhocetus, a purported “walking whale.” It was a four-legged animal with a whale’s tail (called a fluke) and front whale flippers. Since only two closely linked scientists had found nearly all of the “fossil” evidence of walking whales, Dr. Werner began to wonder if the other walking whales were created in this same way. In 2013, he interviewed the second scientist, Dr. Hans Thewissen, (a former student of Dr. Gingerich), who found the walking whale called Ambulocetus. Dr. Werner said, “It was like Déjà vu. I walked in for the interview and saw the skeleton lying there on the table and I was again stunned. The most spectacular part of the fossil, a partially evolved blowhole, was missing on the fossil. It appeared that Thewissen had added whale parts (in this case a blowhole) to the areas where he had no fossil evidence, just as his former professor had done.” When Dr. Werner began questioning Dr. Thewissen about the shape of the skull and missing fossil parts, Thewissen retracted the entire blowhole idea even though he had supplied the world’s top museums with skeletons having blowholes. 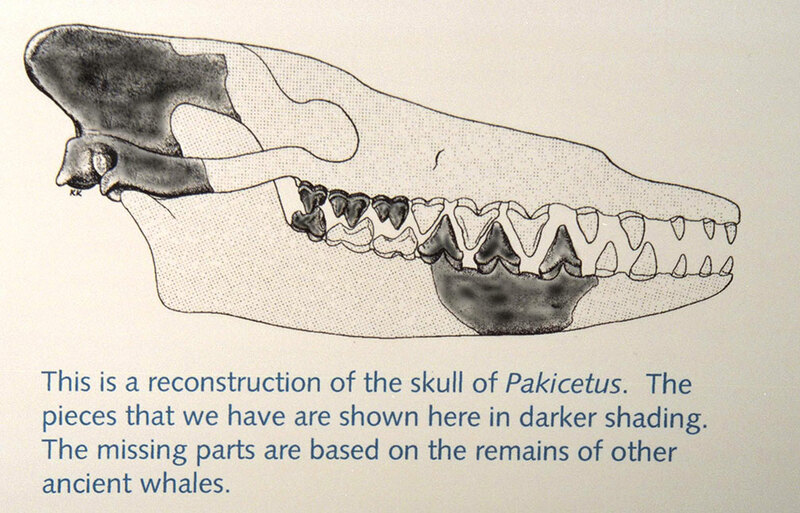 In the 1980s, Dr. Gingerich found a few scraps of a skull (in charcoal grey below) and imagined that the animal called Pakicetus was a missing link, an animal halfway evolved between land animals and whales. He then created and supplied this full skull (above) to museums (the American Museum of Natural History in New York, The Ditsong National Museum of Natural History in Pretoria) and the producers of the National Geographic television special When Whales Had Legs. 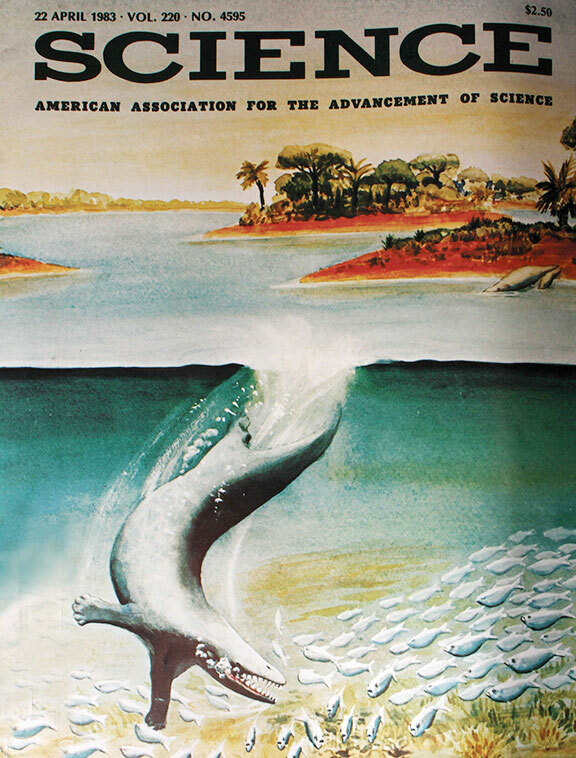 He also supplied this artistic drawing (below, left) of this “walking whale,” (complete with flippers, whale ears and whale neck) for the 1983 cover of Science. Later, a full skeleton of this same animal (below, right) was found in 2001. Contrary to what Dr. Gingerich had imagined, it was a land mammal. There was no blowhole; there were no flippers (only hooves); and there was no whale’s neck. 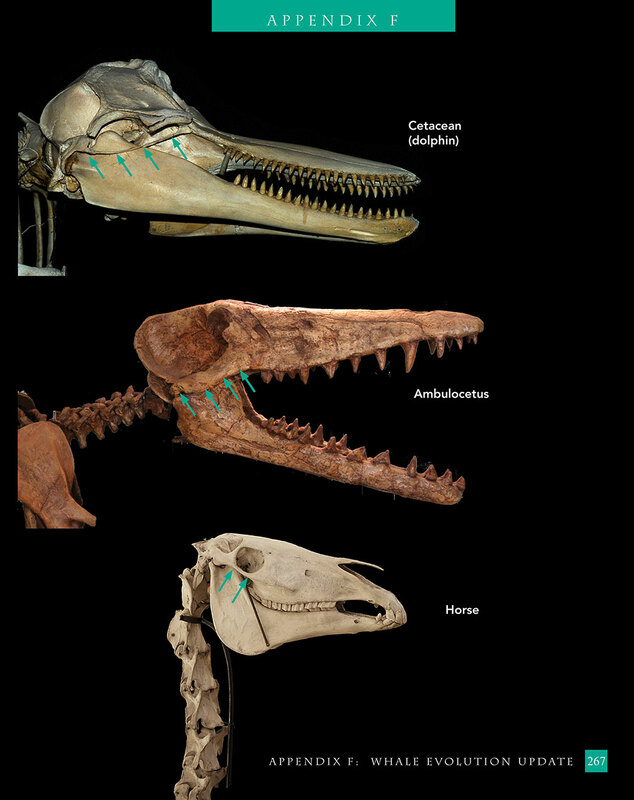 Even so, the American Museum of Natural History in New York and The Ditsong National Museum of Natural History in Pretoria continued displaying the false “walking whale” skull with a blowhole supplied by Dr. Gingerich. There are a host of other problems with walking whales that Dr. Werner documents in the recently released 3rd Edition of EVOLUTION: THE GRAND EXPERIMENT. Read it now!